Are you looking for producers, distributors and viewers? Highlight your short film in the World of Shorts! Do you want to show your short to the world of shorts? World of Shorts magazine offers an opportunity for selected filmmakers to highlight their shorts on its pages and on the dedicated platform of Daazo.com. We are going to take tons of magazines to the Sarajevo and the Venice Film Festival later this summer. How does that sound? 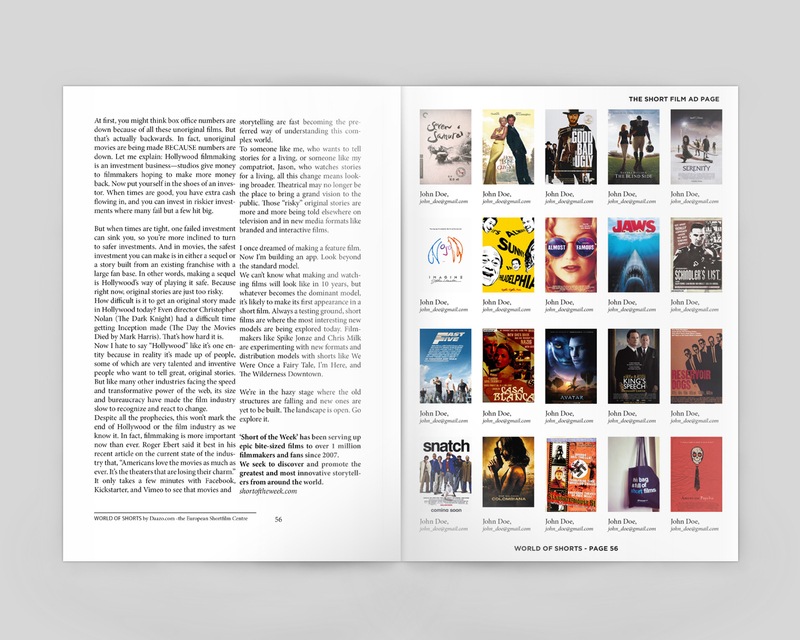 40 films will be included in the Short Film Highlights of the World of Shorts mag and their posters displayed on two pages, together with the directors’ contact info. These pages will be linked to a channel on Daazo.com which will gather the online version of the films - in a password protected or public version. About World of Shorts magazine: The Venice, Sarajevo issue of World of Shorts will appear in print (5,000 copies) as well as online (sent directly to over 20,000 short film lovers). The paper copies will be distributed at Sarajevo and Venice short film screenings and industry events to professional partners and audiences. The last issue of World of Short, the Cannes edition, was read by over 38,000 people, and counting! Here you can find the online version of it. About Daazo: Daazo.com is one of the most important hub for European short cinema. You can upload and watch quality shorts, find other professional opportunities, such as film contests, workshops, traveling film festivals. Daazo has recently launched its sales activity in partnership with several VOD platforms and televisions in order to shake up the short film industry. Check out how it will look like!. Hurry up - spaces are limited! Step 1. Click the Buy Now button below! Step 2. Fill in the entry form!